Invested in America. SIFMA is the voice of the nation’s securities industry. We advocate for effective and efficient capital markets. In the latest episode of The View from Washington, SIFMA’s Ken Bentsen sits down with SEC Chairman Jay Clayton. Watch their discussion for insights into the Commission’s agenda for 2019, including Reg BI, Title VII, proxy and more. 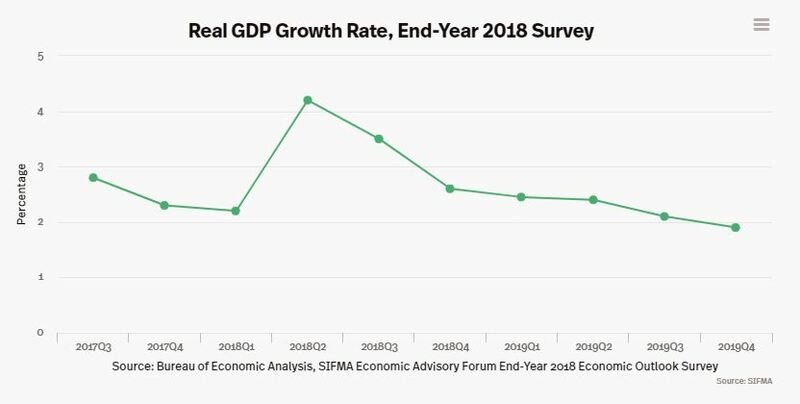 SIFMA’s Economic Advisory Roundtable forecasted that the U.S. economy will grow by 2.9% in 2018 and by 2.6% in 2019, unchanged from its mid-year predictions. SIFMA and BPI are gathering policymakers, practitioners, financial researchers and subject matter experts at the 6th Annual Prudential Regulation Conference. Join us to assess how the post-crisis prudential regulatory framework is affecting the capital markets, including market liquidity, capital formation and innovation. Please fill out the appropriate application; our Office of Member Engagement will be in touch with more information on membership dues and benefits.